Modern Slavery is where traffickers and slave masters use whatever means they have at their disposal to coerce, deceive and force individuals into a life of abuse, servitude and inhumane treatment. Although this often involves an international cross-border element, it is also possible to be a victim of modern slavery within your own country. Following the launch of the Charter against modern slavery at a recent Council Meeting - at which it received cross party support - the Council will now produce a Modern Slavery statement, which will incorporate the Charter, and will be reviewed annually. 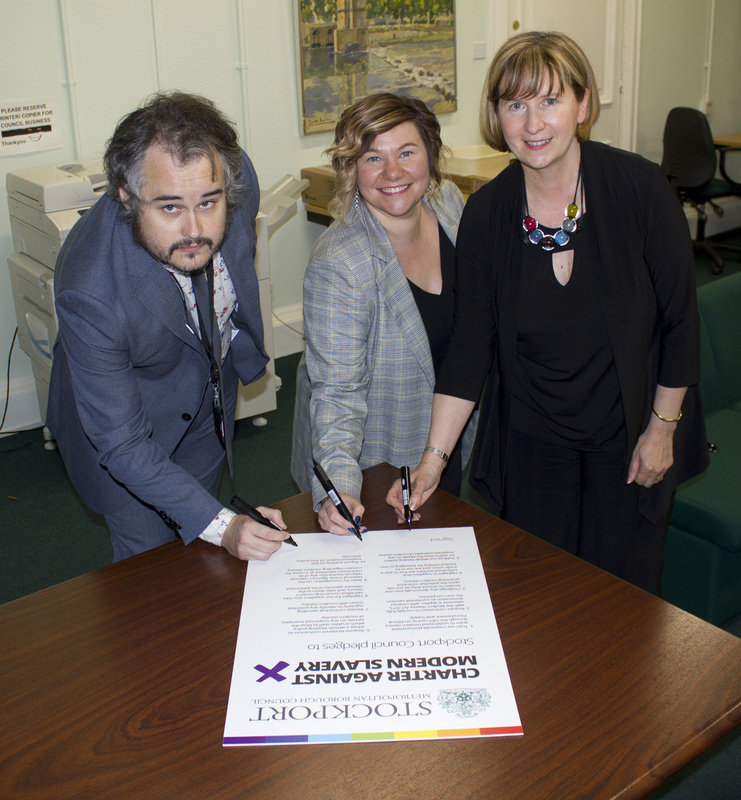 Councillor Elise Wilson, Cabinet Member for Reform and Governance said, “The Modern Slavery Charter has achieved cross party support from Stockport’s Councillors. This is a very important process which will lead to a Modern Slavery Statement along with annual reviews of this Statement, affecting Council staff, contractors and suppliers to the Council, all to ensure that public money does not end up supporting the exploitation of vulnerable people through modern slavery. I am proud to support this Charter”. Councillor David Meller, who proposed the Modern Slavery Charter at the Council Meeting, said: “The Modern Slavery Charter is already being adopted by councils up and down the country and I am very proud Stockport has now done so. The purpose of the Charter is to build on the very good work done by successive governments on this issue by ensuring any abnormally low-cost tenders are challenged, council staff are trained appropriately and even terminating contracts with those who fail to comply with the Modern Slavery Act”. Councillor Meller added: “Councils up and down the country spend more than £40 billion every year on our behalf. It’s incredibly important we ensure none of this money, which should be supporting businesses and our communities, ends up in the pockets of those who exploit others. The Council’s statement, which will include the Charter, will be a huge step towards ensuring this doesn’t happen”.